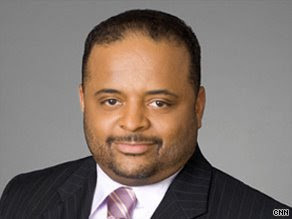 Editor's note: A nationally syndicated columnist, Roland S. Martin is the author of "Listening to the Spirit Within: 50 Perspectives on Faith" and "Speak, Brother! A Black Man's View of America." Visit his Web site for more information. Roland S. Martin says issue of Obama's birth certificate is being pushed by conspiracy theorists. (CNN) -- The YouTube video of an out-of-control woman yelling and screaming at Republican Congressman Mike Castle's town hall meeting in Delaware, demanding to see the birth certificate of President Barack Obama, is utterly hilarious. To watch others cheer her insanity, and then boo the congressman who says the president is an American, shows you that we have a serious problem with mental illness in this country. The nut jobs that continue to promote this story are wacky, right-wing radio and TV talk shows hosts and no-credibility bloggers. They have latched onto this story like bloodsucking leeches, and actually want us to believe this story has legs. Last week, in a suit filed by perennial presidential loser, Alan Keyes, they even tried to claim a court victory after a federal district judge in California asked to listen to the merits of their case. I'm sure he simply wanted to see for himself how delusional they are. From the moment President Obama entered the race, he has had to endure the so-called flag-waving American patriots who think they are the arbiters of what's right for the country. What cracks me up is that in order to justify their loony beliefs, they say, "The president could just end this once and for all by producing the birth certificate." Do you actually believe these wackos will stop there? They will then accuse the president of doctoring the document and ordering up the state of Hawaii and federal officials to create the birth certificate. The next thing you know, one of those nut job right-wingers in Congress -- and yes, there are left-wing nut jobs as well -- will demand a federal investigation into the production of the birth certificate. During the presidential campaign last year, the issue of whether Barack Obama was a "natural born citizen" legally qualified to be president was scrutinized by reporters and researchers who concluded that Obama was born in the United States. For example, in August, 2008, factcheck.org published the following: "FactCheck.org staffers have now seen, touched, examined and photographed the original birth certificate. We conclude that it meets all of the requirements from the State Department for proving U.S. citizenship. Claims that the document lacks a raised seal or a signature are false." President Obama is right to ignore these losers. They are right up there with Holocaust deniers like Mahmoud Ahmadinejad, and the people who insist that the landing on the moon was done in a television studio. Conspiracy theorists are everywhere. It's just that today, we have to deal with the Internet and all the mess that is disseminated in the name of so-called transparency. So nut jobs, keep it coming. In such difficult times, we all need a good laugh every now and then, and you provide great comic fodder. Every blogger/commenter who feels that there are no issues with Obama's eligibility all raise one issue, over and over again: ""FactCheck.org staffers have now seen, touched, examined and photographed the original birth certificate. We conclude that it meets all of the requirements from the State Department for proving U.S. citizenship. Claims that the document lacks a raised seal or a signature are false." FactCheck took a look at a certificate of live birth issued by the state of Hawaii. The certificate of live birth says, right on it, that it constitutes "prima facie" evidence that Obama was born in Hawaii. Does anyone out there other than lawyers understand what "prima facie" evidence means? It means that it creates a rebuttable presumption that Obama was born in Hawaii - it does NOT constitute irrefutable evidence that he was born in Hawaii. In a court of law, if an attorney is presented with prima facie evidence by the other side, the attorney marshalls evidence to rebut the rebuttable presumption, i.e., to prove otherwise. This whole meme out there that the certificate of live birth constitutes "proof" of anything is the "big lie" that the media keeps repeating. Go ahead - check it out: http://www.factcheck.org/UploadedFiles/birth_certificate_6.jpg. Old Russian saying, You can tell say lie 1000 times, but not change truth. Difference between USSR Communist media and USA "mainstream media"
In Russia government make media say what they want - even if lie. In USA "mainstream media" try make government what they want - even if lie..
.....eventually they become same thing?! Could Barack Obama be a one-term president?